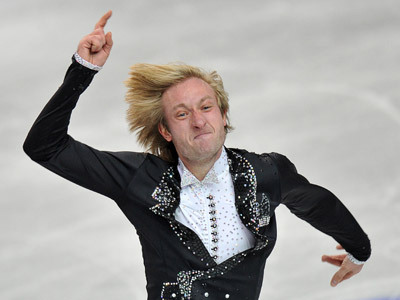 The Russian pair Tatiana Volosozhar and Maksim Trankov came within inches of world figure skating gold, losing just 0.11 of a point to their German rivals Aliona Savchenko and Robin Szolkowy. 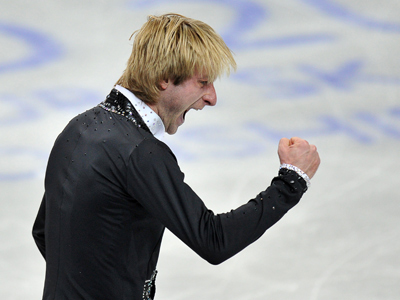 The Russians faltered at the start of the competition, finding themselves in eighth place after a short program. But they fought back on Friday night with a dynamic free skating performance brimming with ingenuity. They almost reached perfection, with Trankov's boundless energy driving the routine, and they could not contain their joy at the end. Trankov clenched his fist and raised his finger before the grinning pair hugged several times. But as it had happened a year ago, Savchenko and Szolkowy were denied their hopes of gold. The Germans did just enough to protect their lead and defend their title from last year. They skated smoothly, knowing they had a huge handicap after the short program. The margin of victory was a narrow 201.49 to 201.38. Narumi Takahashi and Mervin Tran of Japan finished far behind with 189.69. Elsewhere, Patrick Chan became the first man in six years to winsuccessive figure skating world titles despite another wobbly performance. Daisuke Takahashi, the 2010 champion, was runner-up for a second time, andfellow Japanese Yuzuru Hanyu won the bronze medal in his first senior worlds.